Robel Tesfahannes spends his days looking for work in Juba. An Eritrean who recently arrived in South Sudan after six years in Tel Aviv, Tesfahannes is one of a new wave of refugees forced out of Israel by the country’s increasingly tough stance towards migrants. Tesfahannes left Eritrea in 2008, fleeing mandatory military service in a regime that tolerates no dissent, and travelled through Ethiopia, Sudan and Egypt before arriving in Israel. He says he was briefly imprisoned before being released into the community. “The Israeli government said bad things about us Africans,” he says, “and I felt Israelis looked at us suspiciously.” He alleges that he was routinely harassed by Israeli police and eventually decided that he had to leave. The country recently announced a deal with Rwanda to deport Eritrean and Sudanese migrants there, claiming they would be given visas and allowed to work. In return, Rwanda would receive economic benefits. But Tesfahannes says the promise of work and security never materialised. Instead his journey from Israel to the world’s newest nation was a tortuous one. 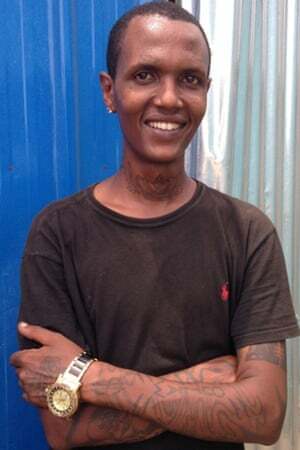 Given $3,500 (£2,200) in cash on departure by Israeli officials, he was flown to Rwanda earlier this year with 10 other Eritreans. Tesfahannes says he was given three nights’ accommodation in Kigali before being told by a Rwandan official that he had to pay $150 (£98) to secure safe passage to Uganda. No work opportunities were ever discussed, he said. With no identification, passport or money, the 25-year-old is in limbo, dreaming of making the journey north to Europe. Until recently, Israel provided a one-off monetary incentive for asylum seekers to leave the country voluntarily if they signed a document giving their written consent. Now the state will give them 30 days to leave; those who refuse will face a hearing that could lead to indefinite detention. Israel has around 50,000 Africans within its borders, including 2,000 at the Holot detention camp in the Negev desert. The prime minister, Binyamin Netanyahu, has referred to them as “infiltrators”. A report recently published by two Israeli NGOs supported Tesfahannes’s claim that African migrants sent from Israel to Rwanda, Uganda or elsewhere in Africa under the new policy are given no work rights or protections when arriving. “The fees for two nights’ stay at a local hotel in Uganda are paid for by the state of Israel. After that, the asylum seekers are asked to leave,” the report says, “with no identification documents and no possibility of proving where they have come from”. A day after a boat sank in the Mediterranean in April causing the deaths of 700 migrants, the country’s transportation minister Yisrael Katz said that the drownings justified Israel’s policy and its fence along its border with Egypt “which blocks the job-seeking migrants before they enter Israel”. Last Sunday in Tel Aviv thousands of Israelis and ethnic Ethiopians protested to highlight the racism against Africans, after a video emerged showing a black Israeli soldier being assaulted by a policeman. A spokeswoman for the Rwandan directorate of immigration declined to comment on the allegations, while Uganda has denied any agreement with Israel to receive migrants. Tesfahannes says that he came to South Sudan because other Eritrean migrants in Kampala told him it was a safer place to stay before making the move towards north Africa, and eventually Europe. The majority of migrants arriving in South Sudan from Israel live in Shirikat, a poor area near the capital city, on the road to Uganda. In the single, dirty rooms of a guesthouse people-smugglers arrange the dangerous trip to Khartoum, the Sudanese capital, one stop on the way up to Libya. He cannot return to Eritrea because of the regime’s ongoing repression, and is stateless – like many migrants making the dangerous journey across the Mediterranean. The International Organisation for Migration fears 30,000 people could drown making the journey this year, unless the European Union establishes an effective search and rescue service. South Sudan, a country riven by civil war with millions facing food insecurity, is ill-prepared to handle this influx of outsiders. The government does not know how many Africans are crossing its borders, though Eritreans in Juba say it’s in the thousands, with more on the way.